The Gaia hypothesis states that all organisms on one planet regulate the biosphere to promote habitability, survivability of species and usefulness to the survival of other species. This means that the near surface rocks, the soil, and the atmosphere, all contribute to the self regulating system of Mother Earth. In short, the Gaia hypothesis points to the earth as a single living entity. James Hutton, the father of geology, even described the earth as a kind of superorganism. These words of Lewis Thomas aren’t just the result of a creative imagination. 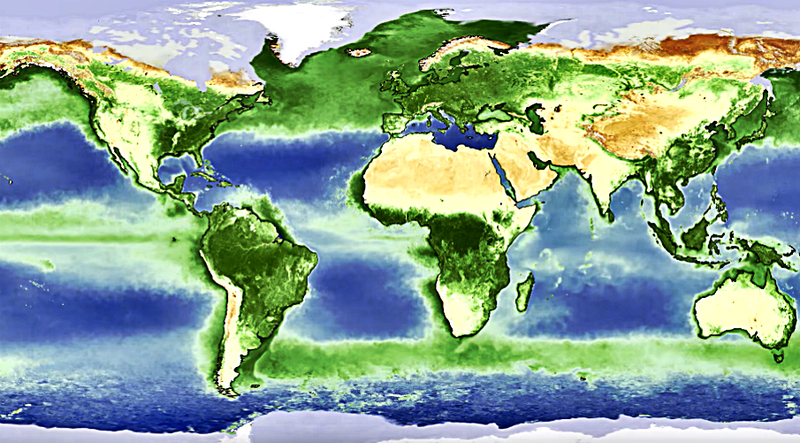 NASA shared a video of our planet that shows how it ‘breathes’ like a living organism. The animation shows the movements we cannot perceive because they are proceeding slowly. A perspective taken as if one year is one minute, shows us how the earth ebbs and flows with the seasons. All of these unnoticed movements, when looked through the right perspective, give us a better understanding of The Gaia Hypothesis. The video, however, doesn’t represent one particular year. This is a combined satellite information taken for several years and is compacted into one animation. Even if The Earth is said to regulate itself to sustain life, human activities still create an impact on how the earth ‘breathes’ or functions. The plants contribute much to the functioning of the earth. As they grow, they absorb carbon dioxide from the atmosphere and release some of it as they die and decompose. But activities like deforestation, or a wildfire, greatly affect the plants’ life cycle. When there are fewer plants, more carbon dioxide would be present in the atmosphere. This would lead to the warming of the planet. This global warming could alter the self regulating pattern of the earth. According to the hypothesis, if the planet is actually a living organism that establishes habitability and survival for its species, most of our actions are directly against this system. This could mean, the greater organism that is our planet, might turn against us, because we’ll be the odd ones, the anomaly that is harming its children. Just like our bodies have an immune system and white blood cells, it’s highly possible that our planet has an immune system itself. Who knows, maybe natural disasters, viruses and droughts are some ways the planet is trying to protect its species from us. But we are its children too. Maybe we are spoiled little rascals, but a mother loves its children, all of them. And it will give us a chance to be better, to fix our errors. Maybe we are living within this period, a period of redemption our planet gives us so we can become aware of our harmful actions and change our ways. Who knows for sure. However, one thing is for sure. Well, two things actually. The first one is that we make harmful actions that affect other species, there’s no doubt about that. The second thing is that this planet, currently, is our only true home. And if we mess things up, it’s us who will be extinct. The planet will be alright. It might be affected, but it will prevail. It might take a long time to heal, but it will heal, it will survive, and other species will be born. Humanity won’t. So videos like this should be a reminder that it’s not all about us. We are a part of a greater whole. We share a home with many other species on a bigger organism we call a planet. And everything is connected with everything else. Everything depends on everything else. Unity, not competition should be our primary intent. Thriving, not survival. It’s not too late to change our actions, and it doesn’t take a lot to do so. If each of us just becomes more aware, we already made the first step. We stand a strong chance. If each of us wastes less electricity, eats less meat, or uses less water, we are going to make a drastic positive change. Just by these simple conscious changes in our actions. The Earth will continue to ‘breathe’ as it does, in a manner that keeps us sustained and alive. And we should honor this by making it a better place for everyone, not just us.